In the dead of January, I want something warm and filling for breakfast, but I also want something bright and cheerful to help me beat the winter doldrums (especially right now while in Washington, as I stare at a grey, rainy sky). A healthy serving of bananas and berries make this oatmeal much more fun than a boring cup o' oats! This dish is a perfect way to start the day, filled with antioxidants from the berries, potassium from the banana, and protein from the oatmeal and egg whites. Plus, lots of fiber! I've made this three days in a row and don't think I'll stop making it any time soon. It leaves me full for hours and has lots of fruit for an added nutritional punch. Frozen berries are cheaper and more sustainable in the winter since fresh berries aren't in season for most of the U.S., and you don't lose any nutrients by using frozen berries. Since they're baked in the oatmeal, they become warm and gooey, dripping berry juice throughout the oatmeal. If you don't like oatmeal but want to fit this powerhouse into your diet, this recipe is the perfect way to do so. 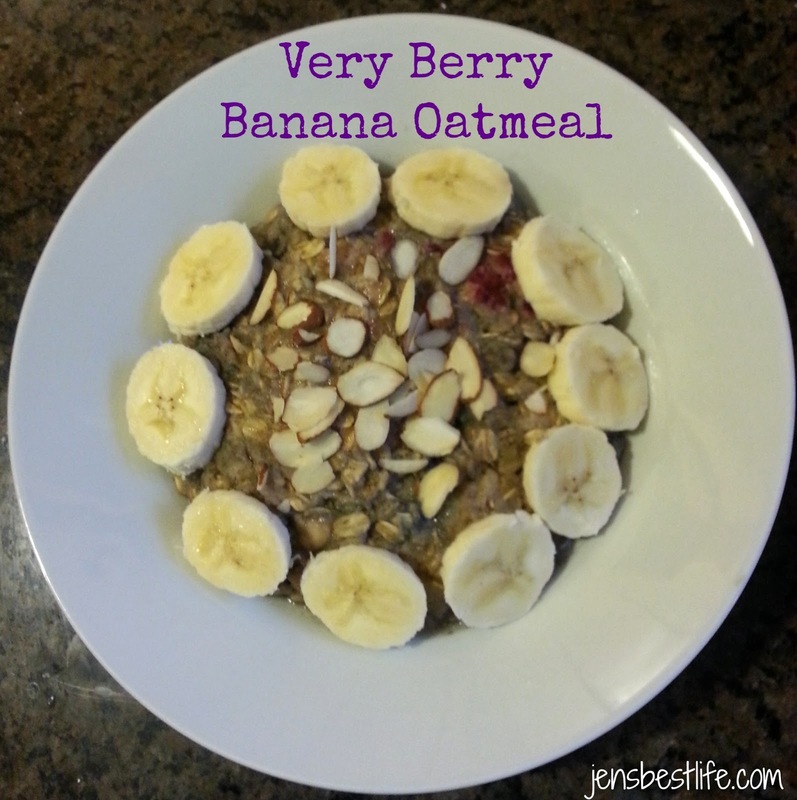 My sister can't stand oatmeal but loved this when I made it for her and even requested the recipe to cook it herself! 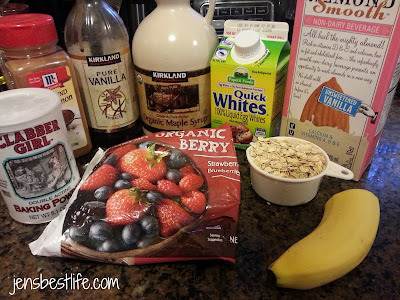 The reason it's great is that it tastes more like an oatmeal bake; no drippy oatmeal here! It might seem like a lot of ingredients, but if you lay out the non-perishable items the night before, this shouldn't take more than 5-8 minutes tops since it comes together very quickly. 2. Add almond milk, egg whites, vanilla, maple syrup, cinnamon, and baking powder. Mix together thoroughly. 3. Mix oatmeal into bowl slowly then add frozen berries and mix. 4. Place bowl in microwave and bake for 1 minute and 30 seconds. Take out and mix, then bake for 1 minute more. Let sit for 30 seconds. 5. 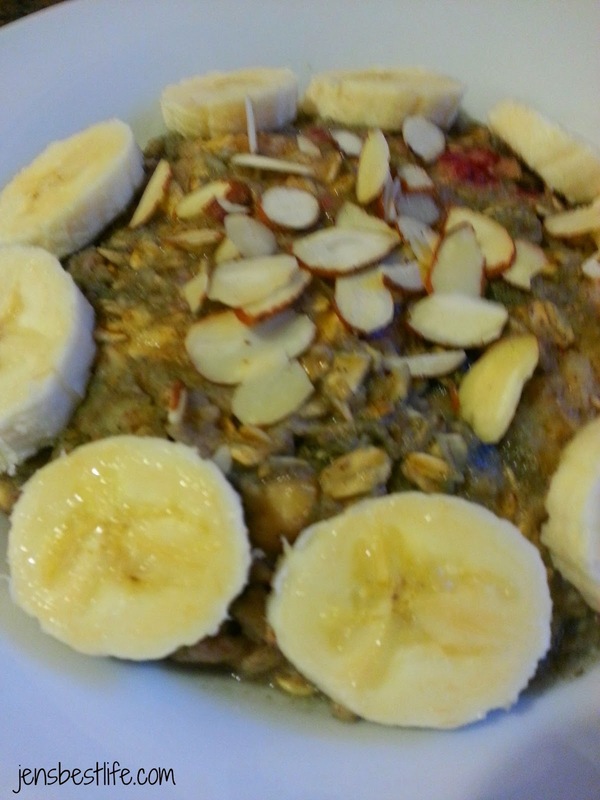 Top with sliced almonds and banana and enjoy your very berry banana oatmeal! Are you a fan of oatmeal? How do you like to make it? Yes, when you're baking there's no reason not to buy frozen! I'm actually from the raspberry capital of the U.S., so I balk at paying such high prices for them in NYC, but I do because I love them so much!